Invasives Strike Force EcoQuest Survey | Lower Hudson Partnership for Regional Invasive Species Management. Welcome to Lower Hudson PRISM's Invasives Strike Force EcoQuest Survey page!!! Do you love being outdoors and searching for interesting critters and plants in nature? Or maybe you love taking photos when you are out hiking or gardening? Or maybe you just love scavenger hunts! Our EcoQuest surveys allow you to become a part of the action and help us document invasive species in our region while having fun in the process! To become an EcoQuest surveyor, all you need to do is download an easy- to-use mobile app, iNaturalist, and register here for further instructions. Once iNaturalist is downloaded, you can immediately start photographing and uploading pictures, instantly connecting you to thousands of other citizen scientists just like you! To help you build up your knowledge of invasive species in our region, we offer a monthly challenge which keys in on a focal invasive species. Each month, Lower Hudson PRISM staff will announce a new scavenger hunt-style challenge to find and document an invasive plant or animal (and their native counterpart!) by taking and sharing photos via iNaturalist. See below for this April's Hello Yellow! challenge, instructions and other past challenges. While you do not have to join our specific project to participate in the challenge, we HIGHLY encourage you to do so. Search for us, Invasives Strike Force EcoQuest , on iNaturalist and join today to upload your photos directly to our project! Become an official member of our team today! 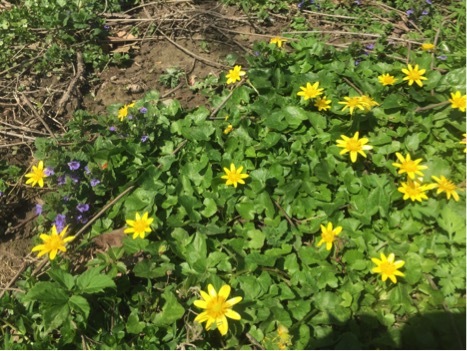 April's EcoQuest challenge focuses on two "yellow sunburst" bloomers that are often mistaken for one another: the invasive lesser celandine, Ficaria verna (also called the fig buttercup) and the native marsh marigold, Caltha palustris. Both have kidney-shaped leaves, occur in moist soils and are low-growing with bright yellow flowers that typically begin blooming in April. See below for more information on what to look for and how to tell them apart! Happy hunting! At first glance, lesser celandine is a delight to our winter-weary eyes with its bright yellow, sunray-style petals (usually 8-12 per flower). However, its early emergence and rapid growth lead to dense mats being formed that crowd out and outcompete natives such as yellow trout lily and spring beauty! You may notice the dense leaf mats before the yellow flower blooms (for scale, the leaves are around the size of your thumbprint this time of year). Let's search for this pesky invasive together! 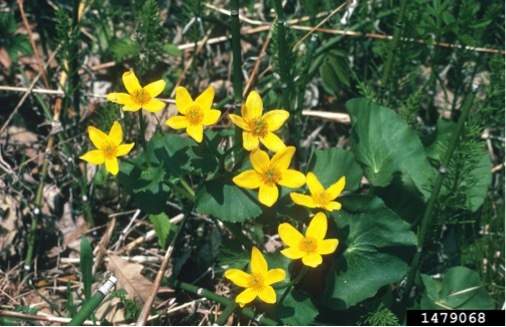 Marsh marigold typically blooms about a month behind lesser celandine. Marsh marigold also typically grows in clumps, not in dense mats,and have fewer and wider petal-like sepals than lesser celandine (marsh marigold has usually 5-6 broader petal-like sepals). The best way to tell if the plant is definitively lesser celandine and NOT marsh marigold without disturbing the soil is to look to see if it has GREEN sepals underneath the petals. If so, then it's lesser celandine! If you see any flowers that resemble EITHER lesser celandine or marsh marigold, please be sure to snap a photo and upload to iNaturalist! For more photos of these target species, simply search for them on iNaturalist and tons will pop up that you can view! I want in! How do I get started? 3. 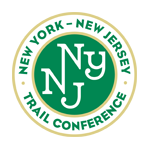 Sign-up at https://www.nynjtc.org/civicrm/event/info?id=10121&reset=1 so you receive notice of each month's species. Take photos of the target specie(s) on your smart phone, then later upload them to the iNaturalist site on your computer. 4. 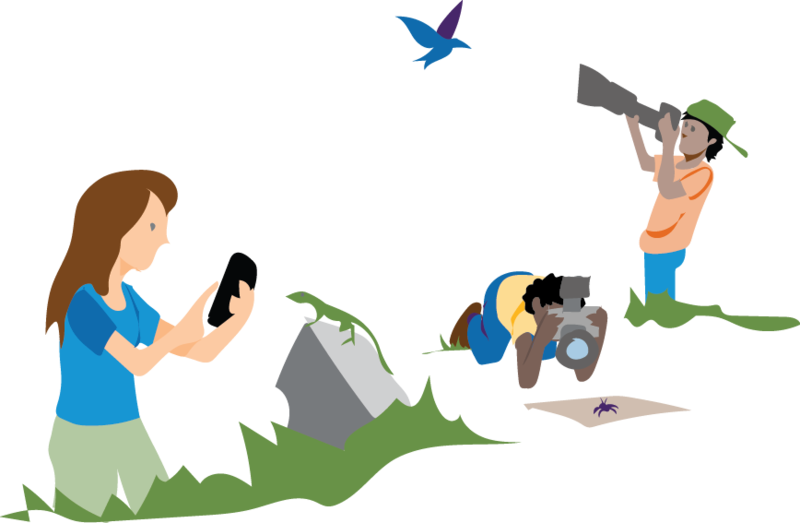 You can either add photos directly to our iNaturalist project Invasives Strike Force EcoQuest or simply upload your photos to the overall iNaturalist database. Our curators will then sort through the posts and add any invasives you found to our project! 5. Keep searching! Your photos will be used to help scientists track the spread of invasives in our region. It's important stuff! This is fun! How do I stay informed of each month's challenge? It's simple! Once you've downloaded iNaturalist and signed up for the project, you will receive notifications from iNaturalist about the next month's challenge as the date approaches! If you have any questions or problems, just shoot an email to LH-PRISM's Invasive Species Citizen Science Coordinator, Brent Boscarino, at brent@nynjtc.org and he will be happy to help! Please also visit the NYBG EcoFlora page to learn more about their history of EcoQuest challenges in New York City. This month's challenge focuses on two "odorous arums" found within the Lower Hudson PRISM region. Native skunk cabbage is one of the first signs of spring. This time of year, the spathe of these plants begin popping up in riparian/moist habitats if you look closely enough- they even do so through snow cover by raising their internal temperature and melting snow around them! 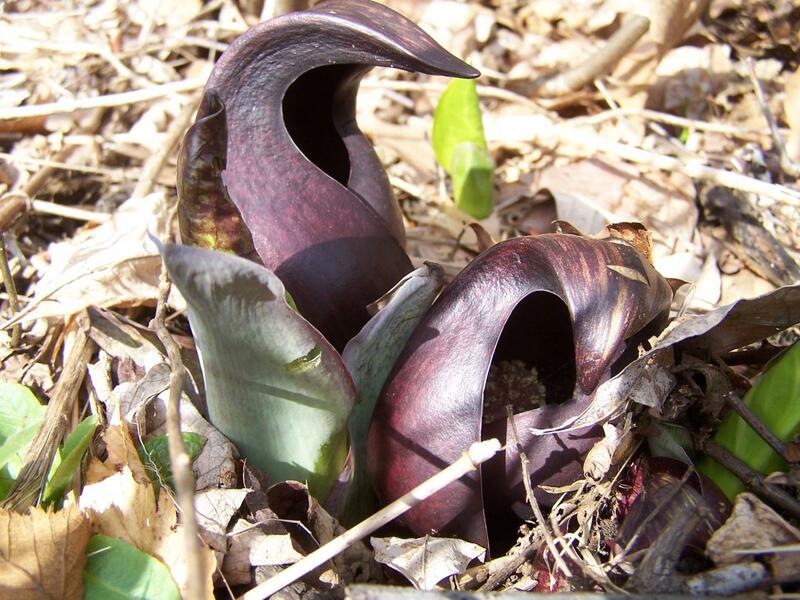 Help us photograph and track the growth and changes of this welcome native arum, skunk cabbage, throughout March! Italian arum is an invasive plant that is threatening woodland and riparian habitats in our PRISM region. This invader notoriously crowds out native species and is inedible due to its dangerous acute toxicity. Although Italian arum does not smell this time of year, when flowering they release an unpleasant odor to attract insect pollinators. Help us document the distribution of this invasive arum so we can limit its spread! Take photographs of these two arums anywhere within our PRISM region and post your findings to our iNaturalist project, Lower Hudson PRISM: Odorous Arums so they can be added to our Lower Hudson PRISM project by our curators.